10 Things To Know Before Getting Your Shaadi Blouse Stitched! The blouse with your wedding lehenga deserves much more attention than you think. Almost every photograph will have your wedding blouse showing through that net dupatta draped over it. Therefore, attention must be paid to every detail of this piece of clothing. Here are a few things to keep in mind when getting your wedding blouse stitched and it’ll turn out looking gorge, we promise! Decide which of the two you want to make heavy - the lehenga or the blouse. Too much should not be happening on both because that’s going to look OTT. The two pieces will complement each other only when one is light and the other has work all over. Accurate bust measurement matters the most to get a well-fitted blouse. In case you aren’t going in for a padded blouse, wear the bra you plan on wearing on your wedding day when you go for your measurements as that will ensure that the measurements are correct. The sleeves of your blouse will be prominent and you have to get this one right, come what may. Opt for work on the sleeves but it shouldn’t be something too elaborate as that will make your arms look heavy. Also, figure out what sleeve length flatters your body type the most and go for that. Sleeves till just above the elbow is our fave length, ladies. Wedding planning stress can either make you put on weight or can make you lose some extra kilos. Thus, always keep around 2 inches of margin for your blouse just so you can get it opened if need be and also get a design made that can be cut and altered to your size if required. Go for your final fitting a week before your wedding to avoid any last-minute fitting issues. Remember that a bigger size can be made smaller, but vice versa is difficult. Make sure your sleeves aren’t too fitted as that will make your arms look bulkier than they actually are. Besides, that will make you uncomfy as well. Most of the rituals will require you to use your arms, so make sure your arm movement isn’t hampered. 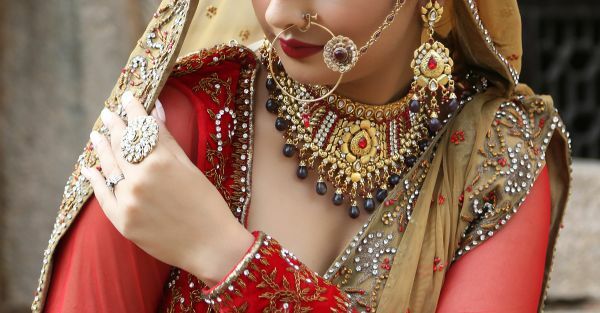 Of course, your wedding jewellery is way more expensive than your wedding lehenga. Get your blouse stitched once you have decided upon your wedding jewellery, especially the necklace you are going to wear. This will help you choose the correct neckline of your blouse, one that will go well with your neckpiece. Your wedding blouse requires extra attention and needs good lining beneath it. For instance, brocades always require thick lining, and crepe or chiffon will fall flat without lining. Make sure all the embroidery work on your blouse is also covered with soft lining, otherwise it will cause you discomfort throughout the ceremonies. If you are a tall bride with an athletic built and a long neck, go for a high neck blouse as that will flatter your height and also your beautiful neck. For a petite body frame, opt for oval and rectangular necklines. The trick for a petite frame is to focus the attention on your waistline. If you have a heavy bust, avoid blouses with too much embroidery on the chest area. Go for a boat neck or off shoulder blouses. For those girls who have a small bust, choose heavier fabrics and heavy embroidery on the blouse to give it a fuller look. 9. What if you have a chubby face? Avoid blouses which have a boat neck or high neckline. Instead, opt for a round neck or a V-neck blouse as that creates an illusion of a longer neck and slender face cut.